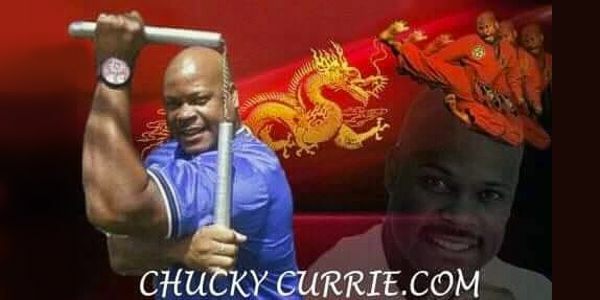 Chucky "Quick Kick" Currie the Best Martial Artists You've Never Heard of! While the charismatic 30-something is legendary on the tournament circuit, it is safe to say that Chucky “Quick Kick” Currie is no target for the paparazzi. “I’m Batman without a cape, the batcar, the money, or that Robin dude,” he laughs. “I see a lot of people who used to come to watch me compete in tournaments go on to get famous and rich in the movies. At one point Chuck Norris named me the new Bruce Lee, and Bill Wallace said I was the best technician he ever fought. Dan Inosanto said that if Bruce Lee was alive he would take me on tour everywhere and make all kinds of movies with me because he would be so proud of what I had accomplished. Ernie Reyes said I was the most dynamic kicker in the USA. What can I say?” Currie asks, “I was just me and I’m glad they liked me for that. I remember once when Bob Wall saw me do a jump triple-kick in midair that he was amazed. His jaw dropped and I just laughed. It’s fun to blow people away. I’m happy for all of them that made it in Hollywood. It’s just that I’ve never been into self-promotion and that’s what you need. But I’m learning. His first tournament win was at the early age of 13 in the San Francisco Bay area. “I didn’t even know I was going to compete,” he says. 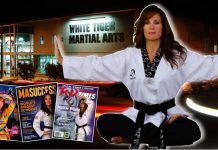 “I just when there to watch and my teacher gave me a gi and told me to get out there. He entered me in sparring, forms, and self-defense and I won all three. Everyone was amazed including me. Since then, I’ve never been to a tournament that I didn’t take home a trophy from, unless I gave it to someone because I didn’t want to carry it.” Since then, Chucky “Quick Kick” Currie has won may international titles and, to this day, still competes. 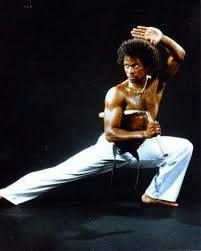 He won the 1998 American Black Belt Championships in soft style forms and also hard style weapons with his sword. Unlike most competitors, though, Chucky Currie doesn’t specialize in only one event he does them all. 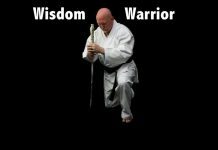 “I’ve competed in taekwondo, karate, and kung-fu and won forms, weapons, and sparring titles in them all.” A masterful technician, Currie received his seventh-degree taekwondo black belt from grandmaster Byong Yu in 1986. 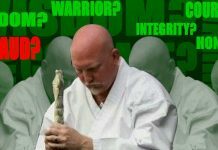 The true proof of Currie’s natural martial genius, however, lies in one of his most unknown accomplishments – he is the first person, anywhere, to ever set a creative martial arts form to music. “I love music, you know. I did so much practicing that I just got into the habit of putting on music when I trained alone. At first I just used it as background music to keep from getting bored. But after a while I just naturally started moving in time to the music. I did it so much that it didn’t seem right to do creative form without it. So then, during one forms competition, I just pulled out my boom box, put in a tape and went for it. I got a lot of criticism from the traditionalists but the crowd went wild, you know? The judges just had to give me a high score. At one event I got a ten from Chuck Norris, a ten from Byong Yu, 10’s from everyone else and just one 9.9. I was hot that night – the Superstar Nationals in the Bay Area. But it was right for me and I kept doing it. Pretty soon other people followed me and then it became pretty commonplace. But I was the first.” Chucky “Quick Kick” Currie even competed against tae-bo originator Billy Blanks in a forms competition getting a first to Blanks’ fifth.